Please be at the venue 1 hour before the show. Seating will be on a first-come first-served basis. Tickets are non-transferrable and non-refundable. For student tickets, a valid school ID will be required upon entry. No school ID = regular ticket price will be charged. By booking a ticket, you agree to the event guidelines as set out in the event details. 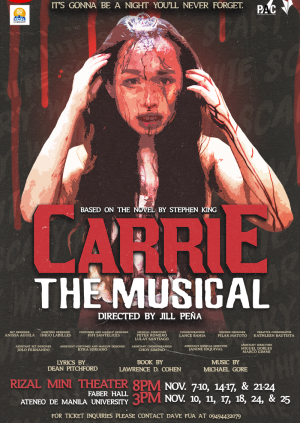 Ateneo Blue Repertory proudly presents CARRIE: The Musical this November 2018. Based on the novel by Stephen King, an eccentric girl finds out she has telekinetic powers and uses it to her advantage despite her overbearing religious mother. It seems that for once, Carrie has a shot at being accepted. Meanwhile, the class’s most vicious bully has other ideas. Pushed to the brink, Carrie’s powers threaten to overwhelm her and devour everyone her in flames. It's going to be a night you'll never forget this November 2018 at the Ateneo de Manila University! For more information, please contact Dave Fua (09494432079). 1. The Ateneo Blue Repertory (blueREP) reserves the right to refuse admission should an audience member exhibit intolerable behavior and failure to correspond by the House Rules set by the organization. 2. Tickets are non-transferrable and valid only on the date and time indicated. Ticket refunds will not be accepted. 3. Rescheduling of shows are up to the discretion of the organization. Immediately contact the Front-of-House Head (09494432079). Rescheduling must be done at least 24 hours before the show date. 4. Audience members will be ushered into the theater by Open House, which is 30 minutes before the show time (7:30pm for 8:00pm shows, 2:30pm for 3:00pm shows). It is recommended that audience members come an hour before this time. 5. Reserved tickets must be paid and claimed at least three days before the show date. Failure to do so will result in a cancellation of the reservation. 6. Free seating will be implemented during Open House. As such, seating will be on a first-come first-served basis. 7. Latecomers will only be allowed to enter the theater after an ongoing musical number is finished. 8. Electronic devices must be turned off. Refrain from using them during the show. 9. Eating, drinking, and smoking are not allowed within the theater. Refrain from singing along to musical numbers. 10. Taking of photos, videos, and audio recordings of the show is strictly prohibited. 11. Parking is available within the Ateneo de Manila University Campus at designated areas. 12. Show schedules may change with no prior notice.